Ceres is puzzling astronomers with giant bright-white spots behaving very differently from each other in infrared light. As the enigma around the anomaly grows, NASA now says their origins and properties are very different. The latest infrared mapping of Ceres shows a diverse mix of climatic and geological phenomena, which can only be explained once the current NASA probe, Dawn, gets closer to its target. Now, the month-old infrared photographs of bright spots, released April 13 in Vienna at a meeting of the European Geosciences Union, are leading to further speculation as to the rock’s history and the presence of water on it. On visible light images taken beforehand, the two anomalous spots appear bright white, leading to speculations about so-called cryovolcanoes. But the newly-released infrared photos show that the spots have completely differing thermal properties. "This dwarf planet was not just an inert rock throughout its history. It was active, with processes that resulted in different materials in different regions. We are beginning to capture that diversity in our color images," Chris Russell, principal investigator for the Dawn mission, says. And NASA’s Dawn probe, which is currently about 28,000 miles (45,000km) away, proves there’s more to Ceres than meets the eye. The truly strange thing was that, upon inspection of the thermal images from Dawn’s infrared spectrometer, the two bright spots – named feature 1 and feature 5 – gave off a completely different light. Number 1 appeared as a dark blob, suggesting that it’s colder than the surrounding surface; while 5, which appeared as two bright spots in visible light images, disappeared completely. This was “the biggest surprise”, according to Federico Tosi, who works on the Dawn Visible and Infrared Mapping Spectrometer (VIR). "Spot number five shows no distinct thermal behavior," he told reporters. "For sure, we have bright spots on the surface of Ceres, which, at least from a thermal perspective, seem to behave in different ways,” he adds. Scientists are still not sure if the spots are water, ice, or “hydrated minerals,” but they can say for sure that stable ice would be problematic so close to the sun. Furthermore, the neighboring Vesta asteroid and Ceres shine differently from each other and, as well as possess different types of craters – both observations hinting at completely different histories. Surprises are not entirely unexpected from Ceres – the body that science still isn’t sure how to classify. On the one hand it’s a dwarf planet, on the other a moon. But one thing is for sure: it shows evidence of a very violent, diverse history, as seen from the temperature spikes between zones on the color photos. Furthermore, ever since astronomers became obsessed with finding signs of water in our solar system, Ceres has been on the list of bodies to survey closely. The mixture of rock and ice is now the subject of the NASA study costing half a billion dollars to determine whether it’s actually a water-filled planet ‘embryo’ which survived from the age of our solar system’s violent birth. Until April 23 it will be too soon to tell, as Dawn has to get within at least 8,400 miles (13,500km) to be able to see anything. That’s when the intensive science phase begins. Until now Ceres has only showed its darker face to the probe. First observed in 1801, Ceres was only upgraded to the status of dwarf planet in 2006. 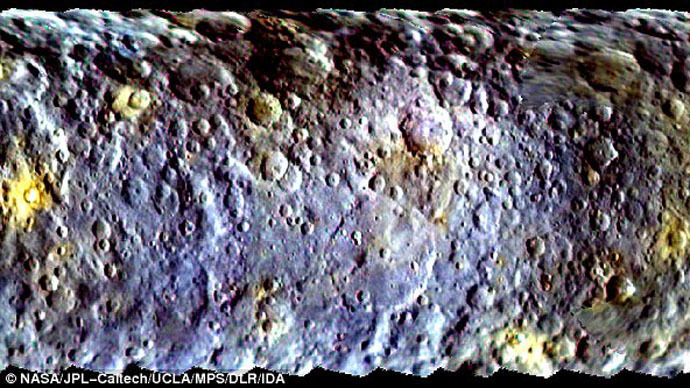 NASA’s Dawn probe was launched in 2007 to study the rock, with a visit to Vesta beforehand. The study will also yield important clues as to the formation of protoplanets some 4.5 billion years ago.